With their debut album, States, out now, The Paper Kites hit the Fly By Night this Saturday, September 21, supported by Georgia Fair. KRISSI WEISS reports. The indie folk scene in Australia, while rich in diversity and filled with an overwhelming breadth of talent, seems to be overflowing to the point of being unsustainable. We all know the awesome bands that have risen to the top like cream for a whirlwind ride and then bubbled away by the next festival season, never to be heard of again, but Melbourne five-piece The Paper Kites have met this problem head on. They’ve gone viral on the internet (okay, so ‘viral’ gets tossed around a lot but nearly 6.5 million YouTube views indicates that’s no overstatement) and introduced themselves to Australia and the world simultaneously. After signing with Wonderlick Recording and Sony Music in a joint venture domestically, and with Nettwerk in North America, The Paper Kites are launching their debut album, States, into the global market. 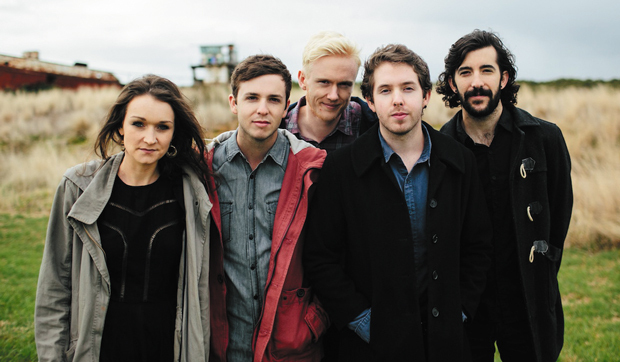 Yet while frontman Sam Bentley agrees that the indie folk scene in Australia is bursting at the seams, he believes The Paper Kites’ approach to songwriting sets them apart. “There are definitely a lot of people in the scene and that’s a problem,” he says. “It’s not that we’ve intentionally tried to avoid that but I do think that the industry, particularly in Australia, is very stuck in the idea of what’s hot and what’s not. We try to write stuff that’s not really going to fit into those categories. Bentley admits that States’ recording process was certainly not a walk in the park. Yeah, people got mad – but they still love each other. Produced by the experienced Wayne Connolly, States has taken the group into a new territory with regard to sonic diversity. Just how these sounds will come to life on the upcoming tour is another concern for Bentley.